Water damage to your home can happen suddenly from a flash flood or burst pipe, or slowly and almost imperceptibly, as with a hidden leak. Either way, taking quick action is the key to minimizing damage. It’s imperative to seek professional help as soon as you know about the problem to prevent even more serious consequences, such as the growth of mold. The costs for removing standing water and repairing water damage will vary depending on the size of the home and the extent of the damage. In almost all cases, the longer it takes to tackle the cleaning and repairs the more it can cost. If a storm caused the flooding, you may have to wait for the water to recede from around your home, but otherwise don’t wait. Wear gloves and boots for protection from contaminated water. Turn off electricity and survey the situation before taking any action on your own; use a flashlight if it’s dark. Don’t take any chances if you suspect a live wire. Open windows to let in fresh air. Check the basement first. As the lowest part of the home, basements are usually hardest hit in a flood. Run fans to help dry and ventilate. Use a sump pump to help remove standing water. Shovel out mud, then hose down and scrub dirt stains. Rinse items that have been submerged with fresh water; then clean with hot, soapy water; and finally disinfect with a mixture of a half cup of chlorine bleach to one gallon of water. Use a shop-vac to get rid of excess water from this cleaning process. Move furniture outdoors to dry if weather allows. Upholstered pieces and mattresses will need to be discarded as they will have absorbed contaminated water and are likely to harbor mold and mildew. Other pieces can be salvaged if they are thoroughly hosed down and cleaned with antibacterial soap and water. Remove soaked drywall, plaster, paneling and insulation. Clean walls that remained dry, but are located in the affected part of your home, with soap and a mixture of one tablespoon of bleach to one gallon of water. Remove any carpeting and the underlying pad. Hard floors, such as tile, can be thoroughly cleaned and sanitized. Wood floors generally absorb too much water and will need to be replaced. It’s important to assess whether the subfloor has gotten wet. It will need to thoroughly dry before any flooring can be replaced. Wait for the professionals to repair electric lines, investigate sagging ceilings, provide asbestos abatement, inspect and repair appliances, and ensure that every bit of water has been removed from your home. Call a professional water mitigation contractor. 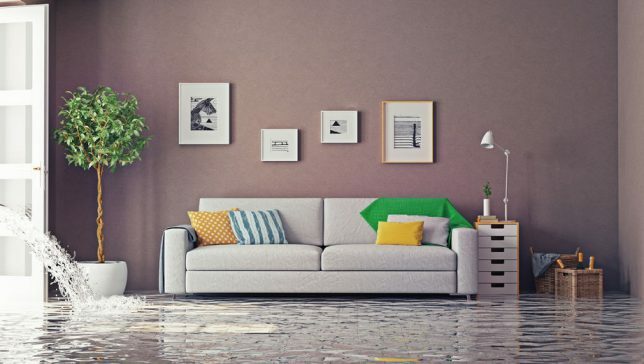 Because many of the effects water damage can have on your home may not be readily apparent, it’s important to bring in a contractor who has experience with water damage, repairs and restoration. Contractor Connection has a network of contractors who serve the water damage repair needs of the insurance industry, and their services are available directly to homeowners. Our contractors have the proper licensing and insurance, and offer a three-year warranty on workmanship. To find a trusted contractor in your local area, enter your ZIP code above.